Veterinary medicine – the 1st place in Poland, agricultural and forest sciences – the 4th place, food, nutrition and environmental sciences – the 5th place in Poland. These are the results of the most recent ranking of Polish schools of higher education. After 16 years of existence, UWM is firmly seated in the 11th place. The website of the Perspektywy monthly has recently published the 16th ranking of Polish schools of higher education, which summarises their results in 2014. In this year’s ranking of universities, we occupy the 11th place among 25 classified universities. This means that we managed to maintain our strong position from the previous year, ranking ahead of the University in Białystok, the University of Szczecin or the Cardinal Stefan Wyszyński University in Warsaw. For the last few years, UWM has constantly maintained its position among top schools of higher education. In 2014, it also ranked 11th in the universities category, and a year earlier it occupied the 10th place. In the general classification, UWM ranked 35th among all 80 public schools of higher education in Poland. The strength of the university results not only from its place in the general ranking, but also from places of its individual fields of study. In this respect, many of our fields of study rank in the forefront: The Faculty of Veterinary Medicine constantly occupies the top place in Poland, agricultural and forest sciences are classified in the 4th place, whereas fields of study offered at the Faculty of Food Sciences and at the Faculty of Environmental Sciences rank 5th in Poland. (Environmental sciences achieved a particularly excellent result, as they progressed from the 14th to the 5th place). Journalism and social communication occupies the 8th place, environmental engineering is ranked 9th, medicine is still classified in the 12th place, and the same result was achieved by biotechnology. The authors of the ranking quote also places occupied by schools of higher education in each of the assessed criteria. The following 8 criteria were taken into account: scientific effectiveness, innovation, scientific potential, employers’ preferences, academic prestige, scientific publications, internationalisation, conditions of education. In terms of innovation, we occupy the 19th place among 50 classified schools of higher education. For example, we rank ahead of the Maria Curie-Skłodowska University in Lublin and the Nicolaus Copernicus University in Toruń. We occupy the 19th place in terms of prestige among academic staff (which means a higher position than in the previous year), the 30th place in terms of scientific potential, the 29th place with regard to conditions of education and the 26th place in terms of employers’ preferences. In the opinion of employers from the Warmia and Mazury Province, UWM outclasses all other Polish schools of higher education. UWM received as many as 100 points, whereas the second university in this classification (University of Warsaw) has only 63. The correctness and reliability of the ranking was supervised by a committee consisting of representatives of important academic centres and companies and institutions employing university graduates, which was chaired by Professor Michał Kleiber – the former President of the Polish Academy of Sciences. What conclusions can be drawn from the analysis of this ranking and previous years’ rankings? One thing is certain: although UMW has existed only for 16 years, it confirmed once again the status of a strong, stable and recognised university that ranks in the middle of the group of Polish universities, which is proved very strongly both by the general classification and by scores of individual fields of study. Are the results of this ranking reliable? Not completely – some important quality criteria were ignored. For example, the score for conditions of education is questionable. In this criterion, UWM ranks only 29th among 50 Polish schools of higher education. 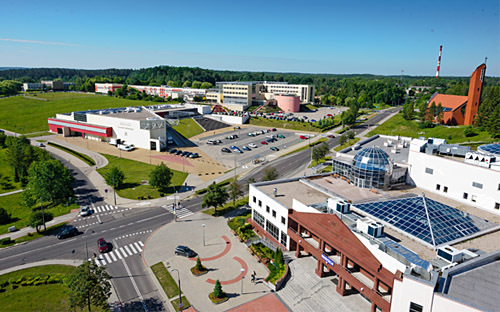 Which school of higher education in Poland has a better campus than Kortowo?